Since buying the Festool Domino joiner about a year ago, I have developed some notions from the viewpoint of one who values hand tool woodworking. Machines, especially one this innovative, can change the way you work, but not automatically for the better. This tool is an invention to facilitate joinery. The principles of good joinery were not reinvented and should not be abandoned for the lure of a new gadget, even one this good. Am I glad I bought the tool? Yes. Would I use this to join the legs and aprons of a dining table? No, the tenons are too short and do not give me enough options, such as haunched tenons. 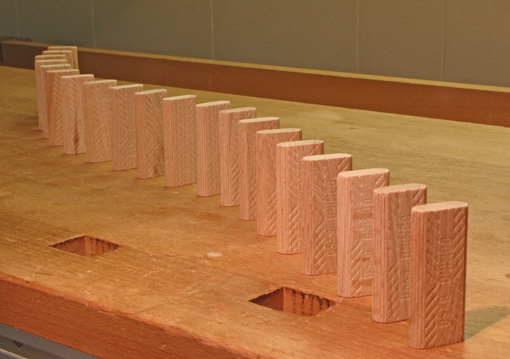 Does the Domino replace traditional mortise and tenon joinery? Not a chance. Holding the work and registering the Domino fences on the work surfaces are critical to success with this tool. The plunge must be parallel to the face of a frame member or perpendicular to the surface of a leg. Use the thickest, longest, and most dominos that reasonably fit. When assembling, apply glue on all surfaces to ensure wetting – generous on the mortise walls, light on at least first half of the portion of the domino that will be buried in single mortise. Lightly chamfer the entering edges of the domino to help distribute the glue on the mortise walls and prevent it from being scraped off. The surfaces of the dominos seem somewhat burnished. Consider lightly sanding them to improve glue wetting, but not to remove thickness. Consider putting a bit less of the domino in the long grain member and more in the cross grain member to make it act like a longer tenon. Adjust the mortise depths accordingly. Longer dominos would be better but that would involve a different machine design. The dominos fit very tightly in the narrowest mortise length (13.7mm + bit diameter). If you do not have room or do not want to use one of the longer mortises, you can get a slight play by sanding off some of the width of the domino. I use a horizontal belt sander to do this quickly. On the earlier version of the machine with the metal registration pins (which I own), it would be better if the pins could fully retract when you do not want to use them, especially when they happen to be close to the edge of the work piece. Bottom line: this is a good tool, but to make good projects you still have to be a good woodworker. 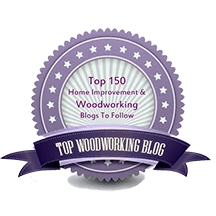 Much has been written about the Festool Domino joiner including reviews here and here, helpful discussions at the Festool Owner’s Group, and an excellent supplemental manual. Your post on the Domino Machine is interestingly timed, in that I am about to build a custom kitchen, and this is a machine I’ve considered buying for just this application. I have never had a problem with any door using haunched mortice and tenon joinery, going back twenty eight years. The question really involves the issue of convenience and time/profitability. All the steps that go into a traditional joint, as you know, add up, and the allure of a couple of pulls of the trigger is strong… however, will a frame and panel door using a domino hold up like a haunched 1 1/4″ tenon over time? What kinds of joinery situations do you feel make this tool a worthy investment for you, and how much time might you spend getting to know its operation before having the confidence to set up a small batch of doors, for example? I think you’re asking the right questions but I’m afraid I don’t have the answers. The Domino has worked well for me with frame and panels. The learning curve is quick once you settle on a method to hold the work, which should be a simple one. I have put a couple of sample joints through my 3-pound-drill-hammer-smash test and they did very well but I can’t really say for sure how they would hold up over time. I would think the loose tenons would be a good way to improve a cope and stick joint’s stub tenon but I do not have experience with that. I just finished 12′ of cabinets for my shop with the Domino, as you say the joints are quite strong when made, and I can’t think of any forces that could substantially weaken them over time. Mine is a small shop, and I don’t have the hours to put down there that I’d like, that being said the Domino has put projects into my reach that simply wouldn’t have been considered before due to time restrictions. Tico – I would endorse taking the plunge and using the Domino. If you do decide to use the domino for rails and stiles, I find it easier to hard-mount the domino business end facing up in a cradle or vise (carefully) and bring the work to it. this seems counter intuitive until you try it, in practice I found it a lot easier to have the domino stationary and a stack of rails I could simply push against the machine one by one. With larger parts, I use the machine in-hand like a biscuit joiner. Substantial care is required to make straight joints no matter whether the machine or the workpiece is loose, I’ve never had a bad joint off the machine that wasn’t my fault, but I’ve had plenty that were my fault. Chips and debris between the domino and the workpiece throwing the resulting joint out of wack are a common cause of expletives in my shop, so watch out for that. Practice helps, as with all woodworking. Trumped up biskits. cuh! pleh! yuk! Thanks for the tips, Bradley. And good luck with the project, Tico. I hook up the Domino to a Fein vac with the tool-triggered switch which makes the operation nearly dust/chip free.